Whether you're just getting married, taking a cruise on the Love Boat, or are a full time Banquet Manager required to wear a tuxedo day and night, you'll find the fine selection Formal Wear tuxedo styles perfect for both work and play. With both classic and trendy styles to choose from, the fabric, cut, and tailoring of our Tuxedos are sure to get you noticed. Let your friends waste their time and money fighting crowds to rent used monkey suits at the mall; meanwhile you'll show up looking like 007 and get the girl. 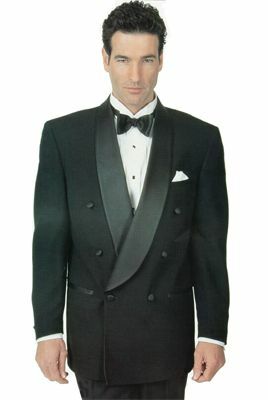 Because the single breasted tuxedo isoften worn open, we recommend that it be worn with a cummerbund or a vest. It can be worn with either a regular tuxedo shirt (either Wing collar or Laydown collar) with a bow tie to match the cummerbund or vest, or with a mandarin front tuxedo shirt with a button cover in place of the tie. P.S. Don't complain to us if people mistake you for a movie star! 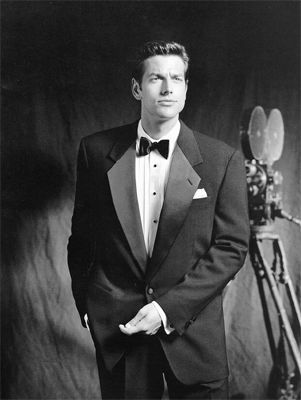 Traditional Double Breasted Peak: This is the stylish, classic, "can't go wrong tuxedo" that has always been and will always be in vogue. Double Breasted Notch: This is a slightly more stylish version of the Double Breasted which is especially recommended for very tall individuals, or individuals who work in their tuxedos everyday, because the notches tend to hold their shape much better than do peaks. The Double Breasted Shawl: This is a very romantic looking tuxedo, perfect for a night on the town, or when you want to wear something a little less ordinary. Although we carry this tuxedo in all sizes up to 56, our experience with this tuxedo indicates that it looks especially good on taller thinner people because of it's round shape which tens to "fill out the wearer". 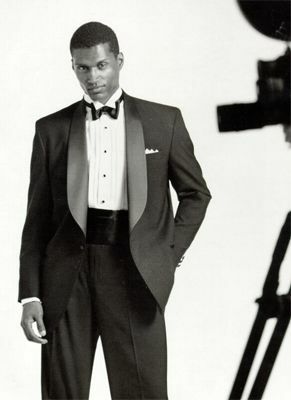 Because double breasted tuxedos are usually worn closed, a fancy cummerbund or vest is not necessary to be worn. Like the single breasted tuxedos, they can be worn with either a regular tuxedo shirt, either wing or Laydown collar with a bow tie, or with a mandarin front tuxedo shirt with a button cover. Pants are normally sized six inches below the jacket size. If you wear a 40R jacket, we would send you an adjustable waist 33-34-35 pair of pants; if you wore a size 46L jacket, we would send you a waist 39-40-41L pair of pants. If your pants need to be a little smaller or larger than that, just indicate your prefered size at the "special instructions" section at the end of the order form, and we'll send you the size that fits you best. Find Wing Collar or Laydown Collar tuxedo shirts here.